Generalised muscle weakness is not uncommon today; we eat too much white rice; it's deficient in thiamine. This is the story of beriberi and vitamin B1; it's the first water soluble vitamin that was discovered. There are some very smart, observant people in the world. Four of them, two Dutch and a Japanese doctor are credited with the discovery of the thiamine, a deficiency of which causes generalised muscle weakness and atrophy and ultimately death. This is the story of how food processing companies take a very healthy food, in this case rice, process it and turn it into crap. Forgive the vulgarity, but I feel strongly on the subject. Somebody, back in the mists of time, discovered that you could polish rice, remove the rice bran and more particularly the rice germ and turn God-given healthy BROWN rice into WHITE crap. That discovery has resulted in the death of millions of people, mostly in the Far East initially where rice is the staple diet, but increasingly in the West as they turn to white rice as a staple; today, with a more varied diet, it's not a frank deficiency but enough to make folk miserable. And the bran/germ extract? Oh, they fed that to the pigs and chickens because it was good for them! Today, those food companies extract the vitamins and oils in the germ and sell them back to you as health supplements at a great profit. Whilst frank beriberi is not common in the USA today, most Americans consume less than the recommended 1.5 mg per day, thus it comes as no surprise that malaise, generalised muscle weakness and tingling in the limbs is so common. Apollo feeding a raven whole grain. 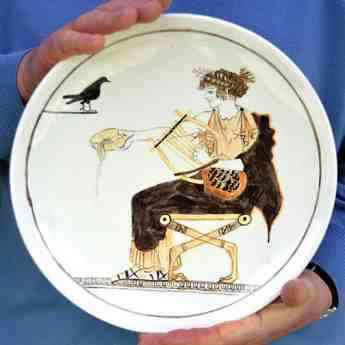 Painting by Lorraine Harrison, copied from a bowl in the Museum of Delphi. Dated 480 BC. The work of four very observant doctors eventually led to the discovery of vitamin B1, or thiamine. Nearly 400 years ago a Dutch physician, Dr Jacob Bonitus, wrote about a "troublesome affliction" that caused generalised muscle weakness, tremors, spasms and numbness in the arms and hands and legs of the local people. He had no idea of the cause of the affliction, but he described the symptoms of beriberi with remarkable accuracy. Our second smart doctor was Dr Takai Kanehiro, a medical doctor in the Japanese navy who observed that nearly a half of the sailors on a long voyage developed these strange symptoms, of whom 25 died of the disease. Their diet was primarily white refined rice. He then drastically changed the diet of the sailors on a similar voyage, and only 14 cases of beriberi were reported with no deaths. Are you still eating refined white grains? Our third observant doctor was another Dutchman; Dr Christiaan Eijkman noted that the chickens belonging to the rich, fed with the scrapings from the table that was predominantly white rice, developed strange spasms with an odd neck posture in extension, now called episthotonus, but those of the poor who ate unrefined starch were spared of this strange malady. Eventually, the observations of these three, and others who followed them, building on their reports, led to the discovery of certain essential substances in food that were other than protein, carbohydrate and fat. And so the first vitamin was discovered, B1, Thiamine, a deficiency of which leads to beriberi. What's really odd, is that people still eat predominantly white rice, sometimes enriched with thiamine. You'd think that we'd learn, but no. And the fourth was another very observant man. Actually it was a colleague of Dr Eijkman, Dr Gerrit Grijs, who eventually put two and two together and came up with four: the rice germ contains an essential nutrient, over and above the three basic foodstuffs, that was being removed by the polishing of rice. Dr Eijkman had been testing a cul-de-sac - that the food companies were inadvertently adding some toxin / bacteria to the rice in the polishing process. But no, they were removing this essential nutrient, vital for the production of energy and the passage of impulses along nerves. The deficiency lead unerringly to generalised muscle weakness, especially of the heart. Eureka! The discovery of vitamins, and Dr Eijkman got the Nobel prize for his work into generalised muscle fatigue and beriberi. It was a team effort really, but he got the credit. Because the nerves to the limbs are so dependent on Thiamine, a deficiency causes wide-spread, bilateral weakness, numbness and tenderness, particularly in the lower legs and calf muscles. Thiamine has a vital function in nerve membranes and interesting the axons of nerves can actually transport the vitamin along the course of the nerve. Confusion may occur with the various syndromes like Morton's neuroma that cause tingling in the toes. Adenosine Triphosphate, generally known as ATP is one of the major forms of energy in the body but the very complex biochemical pathways are driven by a thiamine-based enzyme called thiamine pyrophosphate (TPP) that is required to break down carbohydrate and protein. All animals are totally dependent on food containing Thiamine, and the germ of grains like rice and wheat, and yeasts are the most common sources. Thus it's no surprise that severe muscle fatigue, especially in the eyes and lower legs is a common feature of the a vitamin B1 deficiency. There are over 24 enzymes in the cells of the body that are Thiamine dependent. The nerves and the heart are especially vulnerable, because this is where these enzymatic processes are occurring at a very high rate. These "oxidative" processes where Thiamine-dependent enzymes are so vital are also occurring at a very high rate in the brain; the deficiency causes the mental confusion characteristic of beri-beri. Moreover, some 30 years ago, scientists Matsuda and Cooper established that Thiamine was localised within the membranes in synapses in the brains of rats. Production of acetylcholine, one of the main neurotransmitters in the brain, is utterly dependent on the presence of Thiamine; without it you can't think properly. Using electronmicroscopes, Pawlik etal established the nerve degeneration (axons) of rats starved of Thiamine, and how the myelin sheath became disrupted. Which interestingly is also what MS causes. A connection? A Thiamine deficiency should be suspected in any person showing signs of senile dementia, particularly as the elderly tend to get into the tea-and-toast mode. This is a double wammy, because white toast contains only 10% of the Thiamine of whole wheat, and tea and coffee (and alcohol) are known inhibitors of absorption. The heart too has a very high rate of oxidation, so any B1 deficiency leads to many serious cardiac conditions including Congestive Heart Failure. The mineral Magnesium is vital in the binding of Thiamine to the enzymes in the body. Any deficiency of magnesium, particularly if coupled to low Thiamine levels due to poor diet, or alcoholism for example, will also cause heart, brain and nerve conditions. Magnesium is found in very high amounts in spinach. Spinach soup and other fresh spinach salad recipes. Research done at Harvard, reported in the Archives of Internal Medicine, shows that eating white rice regularly increases the risk of type two diabetes mellitus - presumably because of white rice's very high glycemic index and carbohydrate count chart. In contrast, eating brown rice at least twice a week was shown to reduce the risk of diabetes. Polished white rice has most of the fibre, vitamins and minerals removed. This is precisely the rice that causes beri-beri and generalised muscle weakness. Whereas generalised muscle weakness speaks of a nutritional deficiency, or perhaps a serious muscle wasting or neurological disease like MS, specific weakness points more to specific nerve impingement syndromes. Carpal tunnel syndrome causes tingling in the hand, a sciatic neuritis paresis in the lower leg. But even that's not simple. Diabetes can cause specific quadriceps weakness for example. However, more often than not, specific weakness in association with lower back and leg pain results from nerve impingement; test yourself. Unless there's a condition called lumbar spinal stenosis, specific muscle weakness in the legs may be confirmed with the use of two tests, both of which you could do at home. Performance of the tests is not difficult but, be warned, the interpretation of the results can be very confusing and remain in the realm of the doctor who is treating you. These two tests stretch the sciatic nerve. If it's tether by a bulging disc in the lower back then they provoke tightness and often pain in the leg. The femoral nerve also supplies the leg, but testing is more complex and best left to your chiropractor. So, vitamin B1, the first discovered, known as thiamine, is vital for health; even small deficiencies can cause a multitude of serious illnesses; beriberi and generalised muscle weakness are just two of them. It's mostly found in whole grain rice and 100% whole wheat, and yeast. If you're enjoying refined white rice and wheat flour then you can expect to be at least mildly deficient in vitamin B1 and suffering from tingling and generalised muscle weakness, especially in the legs; and possibly a lot worse. 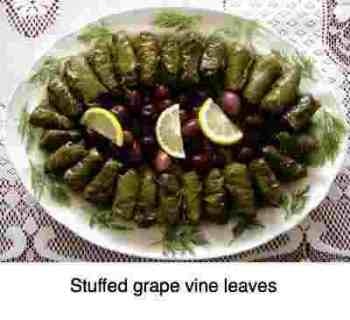 A delic, if slightly fiddly recipe, based on the Mediterranean diet is vine leaves parcels made with thiamine-rich brown rice, zucchinis and olive oil, stuffed in vine leaves.